Skin gets nourished and a renewed glow with Weleda Wild Rose Creamy Body Wash. It’s a moisture-rich cleanser with a hopelessly romantic aroma that harmonizes your skin and tantalizes your senses. Organic rosehip seed oil is highly concentrated with deeply moisturizing essential fatty acids that nourish your skin to a velvety smooth finish. Gentle vegetable-based cleansers work gently, without synthetic detergents, so your skin is naturally clean and soft. Rich in vitamins A and E and potent antioxidants, your skin soaks up our unique skin-replenishing nutrients and feels smooth and revitalized. When showering with Weleda Wild Rose Creamy Body Wash, your entire being feels renewed, looking as beautiful and smelling as sweet as the purest organic roses on earth. Un pur régal sous la douche. Le parfum de rose est formidable et reste légèrement sur la peau. La texture est agréable. 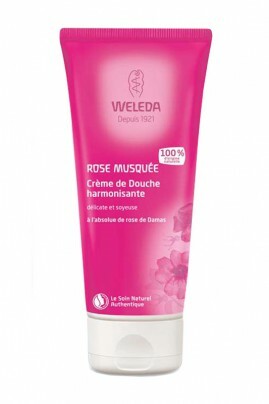 Apply Weleda Wild Rose Creamy Body Wash to the body with a loofah or hands and rinse thoroughly. Water (Aqua), Sesamum Indicum (Sesame) Oil, Coco-Glucoside, Alcohol, Disodium Cocoyl Glutamate, Glycerin, Chondrus Crispus (Carrageenan), Rosa Moschata (Rosehip) Seed Oil, Rosa Damascena (Rose) Extract, Xanthan Gum, Lactic Acid, Fragrance (Parfum)*, Limonene*, Linalool*, Citronellol*, Geraniol*, Citral*, Eugenol*.